Even as there is no trace of a Pathankot-bound taxi (HP 01D 2440) hired from Gaggal in Kangra district eight days ago, the body of the driver, Vijay Kumar, has been found in Kangra. The photos of the three suspects, caught on CCTV cameras at Gaggal Chowk, are with the police and security personnel. 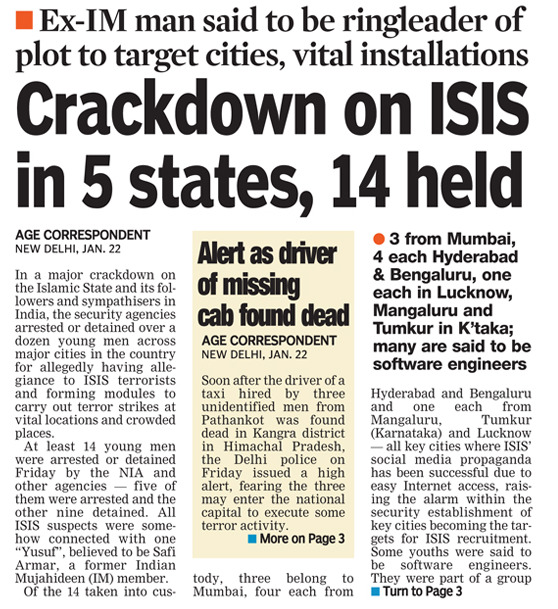 The Delhi Police sounded an alert on the missing taxi this morning and released the photos of suspects to the media. It may be recalled that taxi driver Ikaagar Singh was found murdered hours before the Pathankot air base attack earlier this month. 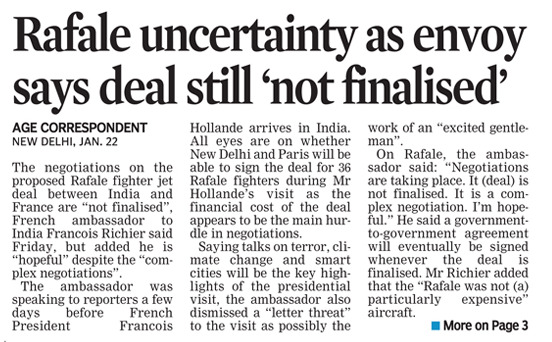 Security in Punjab and Chandigarh has been further beefed up in view of French President Francois Hollande's visit to Chandigarh on Sunday. Murdered taxi driver Vijay Kumar belonged to Gurdaspur but was residing in Gaggal near Kangra with his maternal uncle, who also runs a taxi. RK Bakshi, Pathankot SSP, said the three suspects spoke in Punjabi. They had hired the taxi in Pathankot, as had been confirmed by the taxi union. No police check post had any record about the stolen car, the officer said. Sapna, wife of the deceased driver, told the police that she called up her husband several times on January 14 but there was no response. The next day, Vijay's maternal uncle, Vipin Kumar, approached the Gaggal police. A search was launched and Vijay's body found was near Kotla bridge on the Kangra-Pathankot road on January 20. A security alert has also been sounded across Jammu and Kashmir. Agencies have sealed the state’s border with Himachal Pradesh at Lakhanpur and more personnel have been deployed to guard the newly constructed cable-stayed bridge on Ranjeet Sagar Lake. In Kathua, the police have put up additional check posts along the highway. 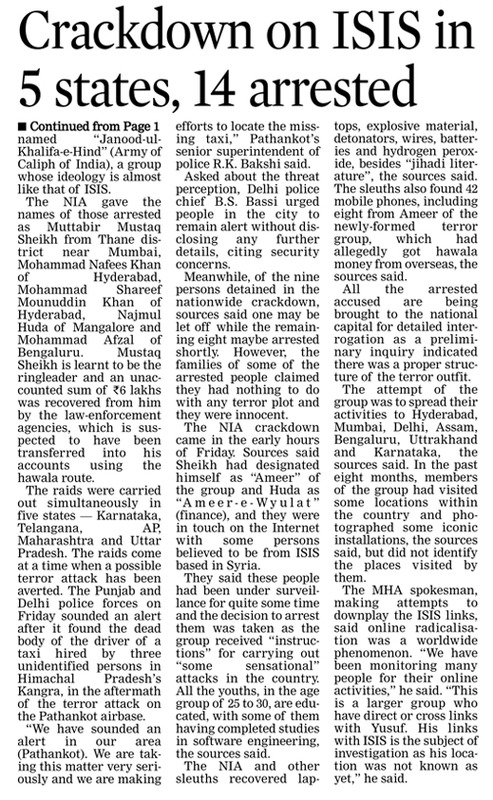 “Security was already tight in the border areas in view of the Republic Day celebrations, but the taxi hijack in Pathankot has heightened the alert. We have sealed all routes leading to Jammu and Kashmir,” said Senior Superintendent of Police Neeva Jain. Danseuse Mallika Sarabhai today hit out at Prime Minister Narendra Modi for failing to pay tributes to her mother Mrinalini on her death, saying this showed his “hate” mentality. The classical dancer-turned-activist, who had fought 2009 LS elections against veteran BJP leader LK Advani from Gandhinagar as an Independent but lost, vented her ire on Modi. “My dear Prime Minister. You hate my politics and I hate yours. That has nothing to do with what Mrinalini Sarabhai did to promote the culture of this country, to the world over 60 years,” Mallika wrote on her Facebook post. In the wake of intelligence inputs of possible attacks by Pakistani militants, the Army, Air Force and paramilitary forces have fortified their formations across Jammu and Kashmir ahead of Republic Day. Security has also been beefed up on the 198-km-long international border and Jammu-Pathankot national highway. A terror alert has been sounded across the Jammu region after the murder of a taxi driver at Kangra in Himachal Pradesh by three unidentified men, who escaped with the taxi. Additional nakas were laid on the Jammu-Punjab border and on the Dunera side of Basohli Bridge in Kathua district. “The CRPF this morning took control of border routes leading to garrison town of Samba. They have also set up random checkposts. The arrangement will remain in place till the Republic Day celebrations are over,” said an official source. In Samba, which has a brigade, the Army has intensified foot patrols while the BSF has laid ambushes at vulnerable stretches on the border. Samba, a major garrison town on the Jammu-Pathankot highway, has always remained on the terror radar of Pakistani militants and has been attacked in the past. 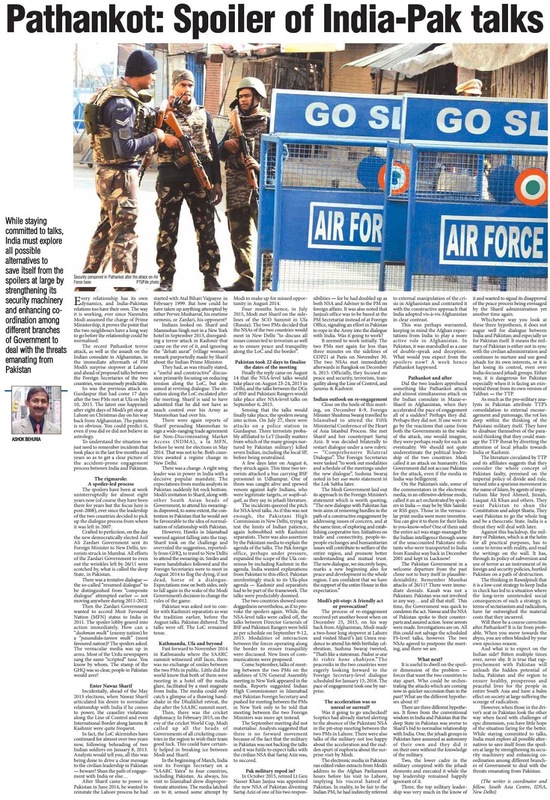 “Samba garrison being in proximity of Indo-Pak International Border always runs the risk of getting attacked and post-Pathankot attack Samba Brigade is taking no chances. We have revisited our Standard Operating Procedure (SOP) that cannot be divulged,” an Army officer said. Intelligence inputs of possible fidayeen attacks and Peshwar varsity-like attacks has prompted security forces to go for a “near watertight” security grid. “All Army installations and units dotting the Jammu-Pathankot highway have been virtually declared out of bounds for civilians till Republic Day is over,” said an Army source. Consequently, the barricading has been strengthened at cantonments on the highway with additional concertina wires, he added. “We have also put up optimum deterrents in and around our cantonments because deterrents enable us to foil terror attacks. Our patrolling is on, ambushes are in place and CCTV surveillance has been enhanced,” he said. South of Jammu, the Army has asked its men to remain extra alert as there could be any mischief, including attacks by Pakistan’s Border Action Teams (BATs), an amalgam of Lashkar militants and Pakistani Army regulars. 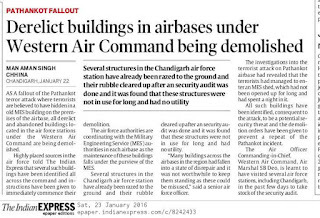 Security has also been heightened to unprecedented levels within and around the IAF Station in Jammu. In the summer capital of J&K too, the security forces are on their toes to ensure a peaceful Republic Day. This afternoon, security personnel in Kashmir went into a tizzy after an input that a suspected vehicle entered Srinagar from south Kashmir. A high alert was sounded and security men stepped up checking of vehicles across Srinagar, where security agencies have already tightened the security ahead of the Republic Day function. To avert any untoward incident, the J&K Police and the Central Reserve Police Force (CRPF) have stepped up round-the-clock patrolling in the city to keep an eye on the situation. In Kashmir, the main R-Day celebrations will be held at the Bakshi Stadium in Srinagar and the Police and CRPF have already started sanitising the areas around the stadium. A police officer associated with the security around the Bakshi stadium said they had carried out many search operations around the stadium. “Various nakas have been placed on the roads leading to the stadium to ensure a peaceful R-Day,” said the officer. He said a thick three-tier security cover would be thrown around the stadium in the coming days. J&K Director General of Police K Rajendra Kumar had already asked for the security review of venues for the R-Day functions across the region. “The security of venues for the functions at different places needs to be reviewed by all agencies concerned and synergy should be ensured to make the celebrations more secure and successful,” Kumar had said during a security review meeting. Not only in Srinagar but reports from various districts of North and South Kashmir said the security have also been enhanced around the venues and important installations. The Islamic State (IS) has threatened to expand its war against India and ‘reconquer Kashmir for Muslims from ‘the cow-worshipping Hindus’. In an interview published in the 13th issue of ‘Dabiq’ allegedly given by Hafiz Saeed Khan, the emir of Khorasan (Pak-Afghan area), the IS propaganda magazine has labelled the Lashkar-e-Toiba (LeT) as an apostate and claimed that ‘specific arrangements have been made to expand the caliphate in the region’. The Khorasan region historically extends from the present day Iran to Afghanistan, Pakistan, Turkmenistan and China. “It (Kashmir) had once been under the authority of Muslims along with the regions surrounding it. Afterwards, the secularist…the cow-worshiping Hindus and atheist Chinese conquered other nearby regions, as is the case in parts of Kashmir and Turkistan,” Saeed has reportedly said in the interview to the magazine. The news item referring to the interview has been carried out by several media outlets in India. 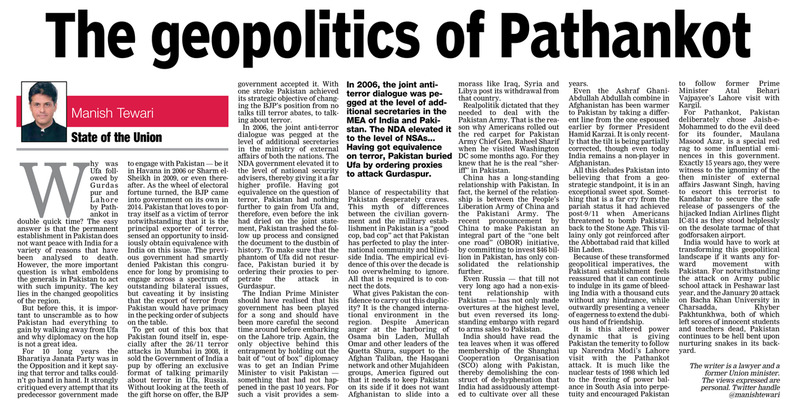 This is the second time that the IS faction in the Af-Pak region has threatened to expand war in Kashmir and India. A few months ago, the group targeted the Pakistan army over exploiting various Islamic organisations on the issue of Kashmir for their personal interests. Though security agencies have so far ruled out any serious threat in Kashmir from the Islamic State, youths have been seen displaying the IS flags during protests in the Kashmir valley, worrying the security agencies and the state police. Security agencies also see this as an open threat and a challenge to the LeT and the Hizbul Mujahideen, operating in Kashmir and carrying out attacks against civilian and military targets since the eruption of insurgency in 1990. 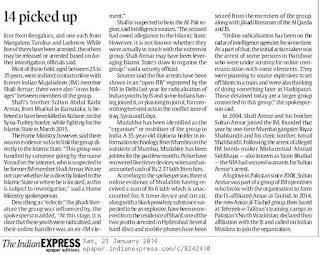 It could also fuel a sectarian conflict in Jammu and Kashmir as the IS follows an anti-Shia, Salafist ideology and has killed Shias and other ethnic groups in Syria and Iraq. THE GOVERNMENT has tweaked its policy to bar Defence forces from buying electronic jammers as per the new “jammer policy” issued by the Cabinet secretariat on Thursday. The policy, revised after the last one was issued in July 2015, leaves out Defence forces from the list of institutions allowed to procure or use jammers with prior approval of the Secretary (Security) of the Cabinet Secretariat. The list includes such bodies as state police forces, jail authorities and central agencies like IB and RAW. 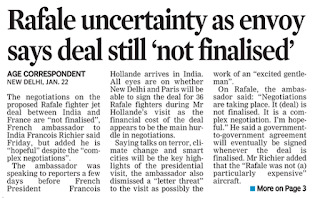 Everything is same in the two versions of the policy — the 2015 one and the one issued Thursday — except the mention of Defence forces, settling a long debated question on whether the Army can use them in India. 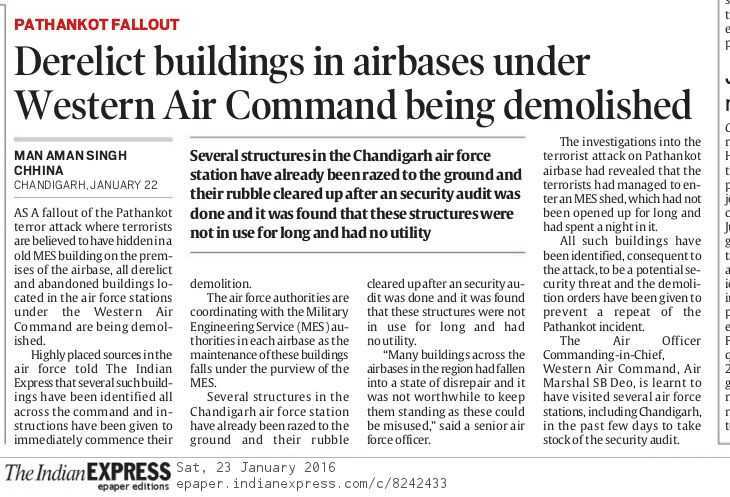 The decision to keep Defence forces out of the list of authorised agencies is seen as a fallout of the Army’s now-defunct Technical Support Division (TSD) having procured jammers in the past. The TSD was set up during the tenure of the former Army chief (now Union minister) General V K Singh. 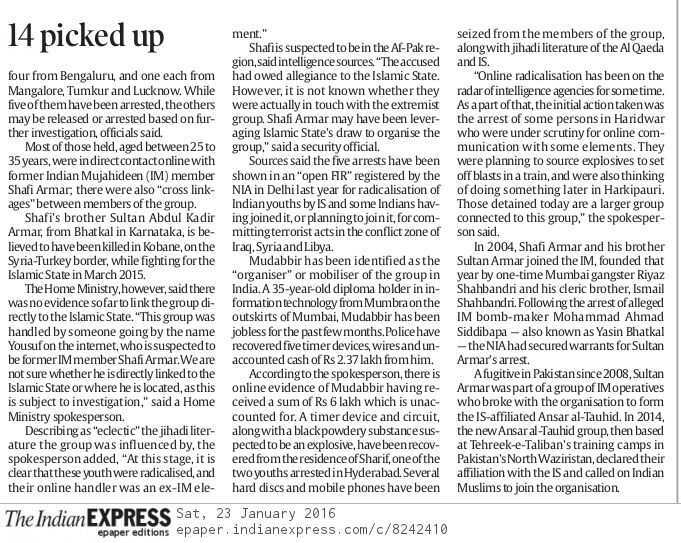 The jammers imported by the TSD for evaluation purpose could not be accounted for after the government decided to close the unit. “Jammers can be procured only by states’ police department and jail authorities, and central government security agencies like RAW and IB,” says the new policy issued by Cabinet Secretariat. Private firms, schools and colleges cannot use jammers. In fact, inviting open bid tenders for jammers is also illegal. Governed through the Cabinet Secretariat, the policy seeks to control the use of jammers – which render mobile, wireless communication ineffective by blocking, jamming or interfering with the frequencies – for a variety of reasons. PSUs ECIL and BEL are the only authorised manufacturers of jammers allowed to be used in India. All other kinds of jammers are illegal. The jammers are evaluated for use by the SPG and the IB, as per this policy. Among other use, public examination conducting bodies deploy jammers to safeguard exams against cheating by use of wireless communication. “The statutory examination conducting bodies are allowed to deploy low powered jammers to prevent cheating during examinations. They would be given permission only to take it on lease basis and would therefore have to pay only for using jammers on the specific date of examination,” the policy says. Producer Rakeysh Omprakash Mehra is pulling all stops to make sure every research on Rifleman Jaswant Singh is in place before starting the shoot. Rifleman Jaswant Singh is a story of a 22-year-old Indian army braveheart never told before on celluloid. Producer Rakeysh Omprakash Mehra, director Sanjay Khanduri and writer Kamlesh Pandey are pulling all stops to make sure every research on the subject is in place before starting the shoot on their ambitious patriotic project. Kamlesh says the story of Jaswant Singh will inspire one and all. “This is not just a patriotic story. It is a story of human endurance as well. Jaswant Singh and his colleagues fought battles wearing canvas PT shoes. All they had as food and rations were just rice and salt which too exhausted soon. For weapons, all they had was the old .303 rifle belonging to the World War 1 era. Enduring such vagaries, Jaswant Singh and his colleagues fought the Chinese without clinching,” said Kamlesh.